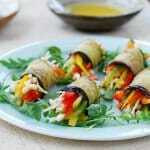 Easy-to-make vegan eggplant rolls! Great as an appetizer. 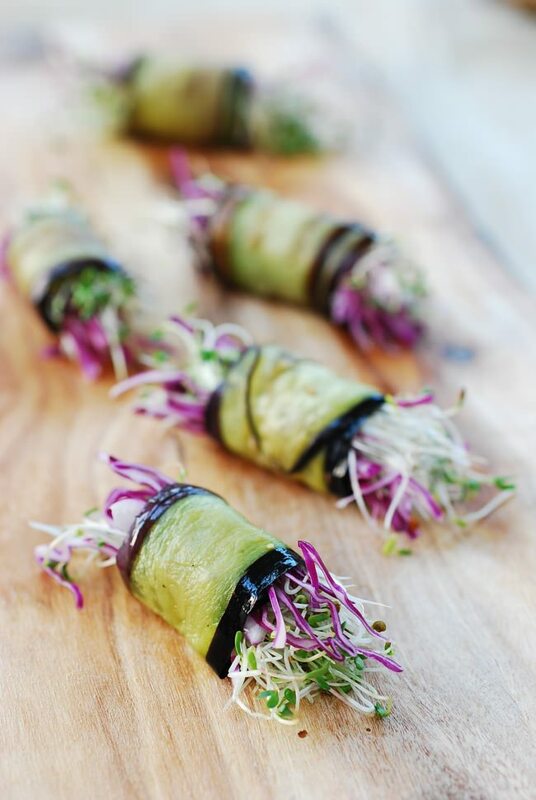 Continuing with the healthy Korean temple food theme, I am excited to share these gorgeous, easy-to-make, vegan eggplant rolls. 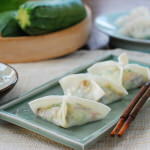 In Korean, these rolls are called gaji mari (가지말이). Gaji is eggplant, and mari refers to rolled up dishes. The inspiration came from a recipe I found in a cookbook I recently purchased. 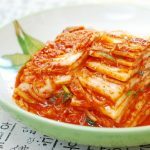 The book, titled “12 Months of Temple Meals”, is authored by a Buddhist nun, Venerable Dae Ahn (대안스님), who is one of the masters of Korean temple cuisine. The recipe in the book is very simple yet elegant! 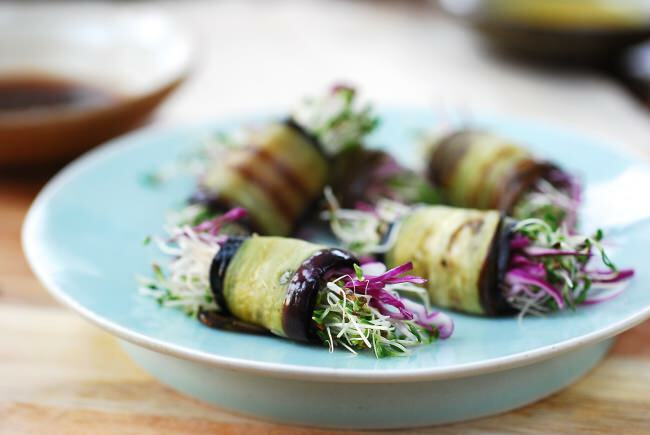 The thinly sliced eggplants are briefly cooked in a skillet, rolled up with sprouts, and served with a hot mustard sauce. I used alfalfa sprouts and added some thinly sliced red cabbage for color and crunch. I also made a soy-based sauce to provide another sauce option. 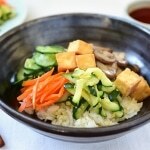 For the fillings, I played around with different vegetables such as colorful fresh bell peppers and enoki mushrooms. They turned out great! Carrots and cucumbers will be great additions as well. 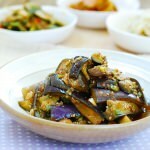 Any long variety eggplants are fine for this recipe. Eggplants cook down significantly, so make sure they are not too slender. I used two beautiful eggplants I bought from the farmers’ market last weekend. It was perfect for these roll ups! The problem with these rolls? They were too pretty to eat! All the tableware shown in the final photos of this post are sponsored by Huue Craft, an online store dedicated to the finest Korean pottery tableware. They ship worldwide to over 25 countries. Visit Huue Craft online store for the beautiful tableware created by five of the renowned potters in Korea! 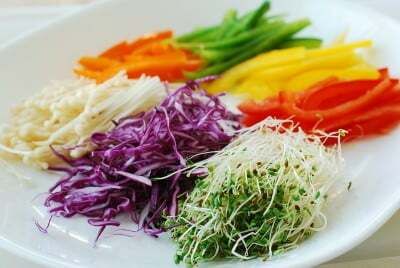 Prepare the filling vegetables by thinly slicing. 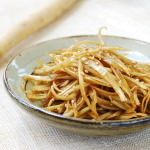 Thinly slice the eggplant lengthwise by running a peeler through the eggplant while pressing it down as hard as you can. Putting pressure on the peeler will help with cutting even slices that are as thick as possible with a peeler. 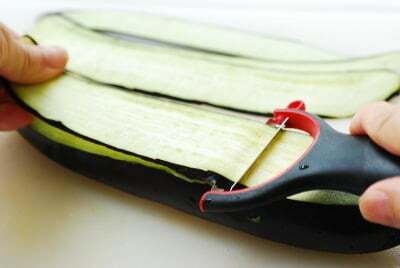 You can also use a mandoline to slice the eggplant. Heat a pan with a tablespoon of oil. 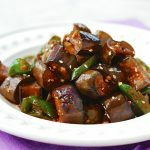 Place the eggplant slices in a single layer, lightly sprinkle with salt and pepper, and cook briefly over medium heat, 1 or 2 minutes per each side. Transfer to a plate. Lay an eggplant slice on a flat surface. 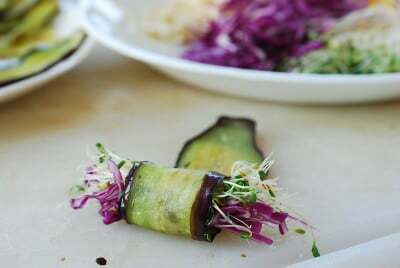 Place assorted vegetables on top at one end of the eggplant slice and roll up all the way. Repeat until all eggplant slices are used up. 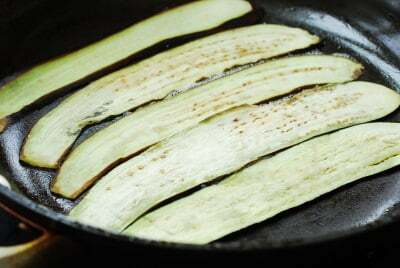 You can get 8 to 10 thin slices from one eggplant, which will be enough for 2 people as a side dish. Oh, my! I agree, they are too pretty to eat! Love the color combination in the rolls. 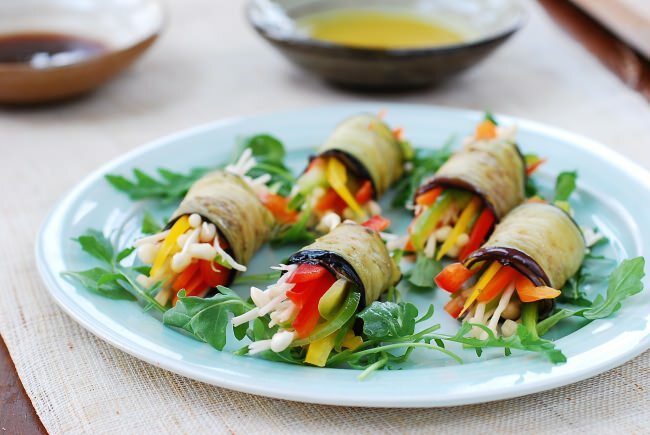 They are mega healthy appetizer, too. Hi Hyosun, recently I saw a talk on YouTube given by Ven. 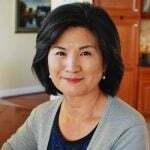 Dae Ahn and was impressed by her creations. 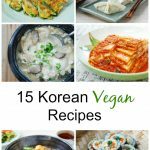 I had been intrigued by korean temple cooking and was happy to find a related recipe! 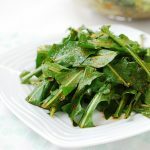 Thanks for sharing this recipe – your recipe was amazing when I made it tonight – the mustard dressing was tangy and light (added a bit of maple syrup instead as I had no pear or maesil jung on hand)! I was wondering if that book (12 months of temple meals) was available in English? I’ve been searching for that book but no one seems to sell it? If you could maybe recommend where to search for it, it will be greatly appreciated! Thank you, SC, for trying out the recipe! I don’t think the book is available in English. Sorry I couldn’t help you there.